Very excited to say that I will be heading to LA for a few days around the time of CHA. On Sunday afternoon, January 30, I'll be teaching a class at Kaari Meng's legendary French General store. Kaari and I have taught at the same venues a few times now and I just love her style. When she invited me to participate in her Art of Craft Workshop series, I dropped everything and went right to work designing a special class project just for her event ... and you. I'm teaching the Love Banner, a layered valentine sampler of beautiful fabrics, trims and notions chosen from her incredible store and my vintage stash. (Although there is some stitching involved, there is a no-sew version too.) Head over to her site and see the fabulous selection of classes offered over three days. You can take one class, a day of classes or the entire event at a nice discount. And we'll have the whole place all to ourselves like a cozy afternoon craft party! On the site, I found a short video of the amazing store in action. 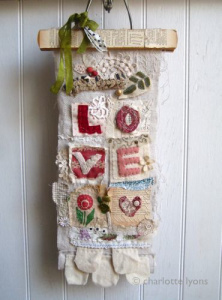 So picture yourself there - with all those yummy beads, bits, notions and fabrics, making something to love, love, love. Notice too that it's a very small shop and the enrollment is limited so if you are tempted, sign up early. Just what January needs. More fun!